I’ll perform with Khepri Dance Company this Tuesday!! Whenever there is a 5th Tuesday, Underground Nomads host a benefit for a cause that our residents believe in and want to support. 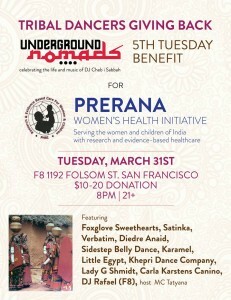 This coming one, on March 31st, is in support of Prerana Women’s Health Initiative.